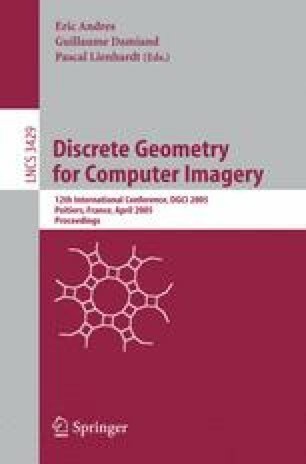 This paper provides a local characterization for a set of digital surfaces S U defined in  by mean of continuous analogues. For this, we firstly identify the set of admisible plates for any surface S ∈ S U (i.e., the intersection S ∩ C of S with a unit cube C of ℤ3 ). Then, the characterization is given in terms of a graph representing the intersection of plates. In addition, we establish a further condition that detects the digital surfaces in S U which are strongly separating objects. The family S U consists of all objects which are a digital surface in some homogeneous (26,6)-connected digital space in the sense of . Moreover, the subset of strongly separating surfaces of S U contains the family of simplicity 26-surfaces and other surfaces in literature as well. This work has been partially supported by the projects BFM2001-3195-C03-01 and BFM2001-3195-C03-02 (MCYT Spain).